Comments: One of six members of this genus that occur in North American and the only one that has been recorded in North Carolina. Adult Markings: Wings are opaque and strongly bicolored: orange, yellow, or red basally and blue-black on the outer half. On the forewing, the colored basal portions extends from the costa to the inner margin; on the hindwing, only the basal portion of the costa is colored. Head and body are also blue-black. Similar but somewhat larger than Pyromorpha dimidiata, which also has a orange basal area and smoky black outer area on its wings. Pyromorpha is more translucent, however, and not as brightly colored. The colored portion of the wing also does not extend all the way across the wing, with the smoky dark coloration running along the inner margin all the way to the base (Forbes, 1923); the hindwings are completely dark. Male Pyromorpha can also be easily distinguished by their pectinate antennae. 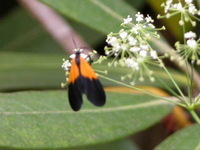 Both of these moths resemble species of Net-winged Beetles (Lycidae) and other flower-feeding beetles, all of which are probably involved in a mimicry complex. Should be identifiable based on a good photo, but sight records need to be accompanied by a detailed description that clearly considers the differences between this species and Pyromorpha. Adult Structural Features: The antennae are thickened and biserrate in both sexes (Forbes, 1960). In Pyromorpha, the antennae are pectinate in the male but thickened in the female and more closely resembling those of Lycomorpha. Immatures and Development: Larval descriptions are apparently unavailable. Habitats: Records for adult habitats have not been recorded in detail but appear to include open, herbaceous habitats as well as woodlands. Habitats used by larvae are not recorded. Comment: Found on the backside of the lake.